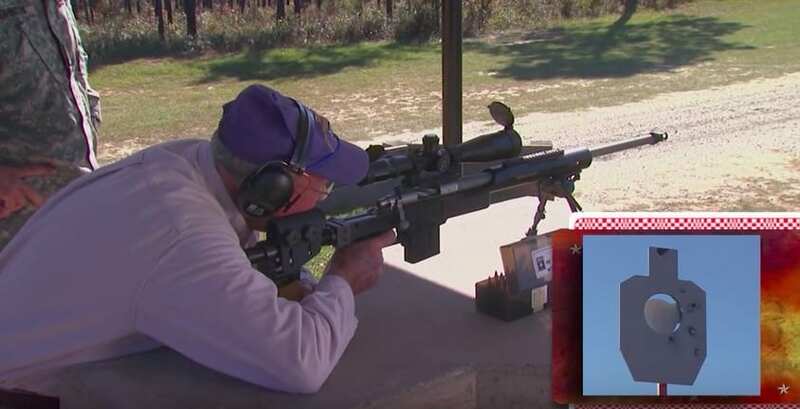 A World War II veteran will get the shot of a lifetime – shooting at 1,000 yards. Will he make the shot? The invention of the gun changed the face of warfare forever. However, the first guns could not shoot very far and were not very accurate. In fact, even up until the American Revolution in 1776, muskets were more or less smooth on the inside, and the bullets themselves were little more than little balls of lead. However, after centuries of advances in bullet technology (resulting in the oblong bullet we know to day) in addition to the advantages of boring a rifle barrel (which results in spiraled grooves on the inside of the barrel enabling the bullet to spin), by the 1820s, it was finally possible to shoot where you aim with an extremely high amount of accuracy. This led to the creation of snipers. 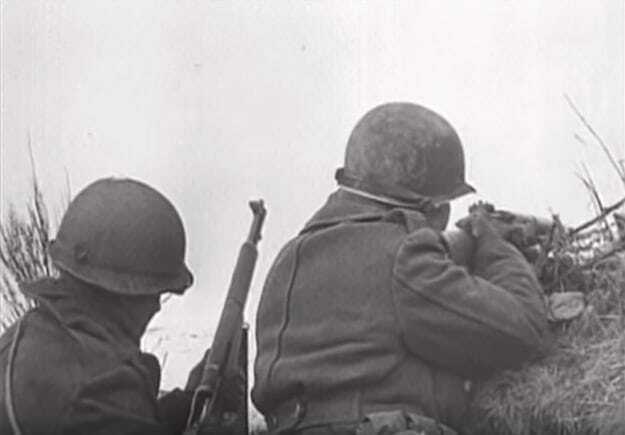 Snipers were expert marksmen who were considered to be able to hit anything they aimed at. The word Sniper derives from the practice of expert British marksmen shooting the Snipe bird in British India. Snipe are birds known for being small, fast, and incredibly difficult to see and shoot. From then on, snipers began to have more and more of an integral role in warfare, really becoming important during the Second World War. In those days, commanders really just took and eagle eyed, calm individuals with lots of hunting experience and gave them a standard issue rifle with a nicer scope. Ted Gundy was just like any other 19 year old who had just gotten out of high school in the early 1940s in Missouri. He studied hard, and he made sure that he was physically fit. This was because the United States was in the middle of fighting World War II, and he had to go off to fight for freedom from the Axis powers. He was handed a rifle, and, with the woods of Missouri flowing through his veins, became the top marksman in his class. It was the winter of 1944 when Ted Gundy first arrived in Europe. He was sent straight into the meatgrinder which was the Battle of the Bulge. Having never seen battle before, him and his comrades were worried about what they would do once the bullets started flying. 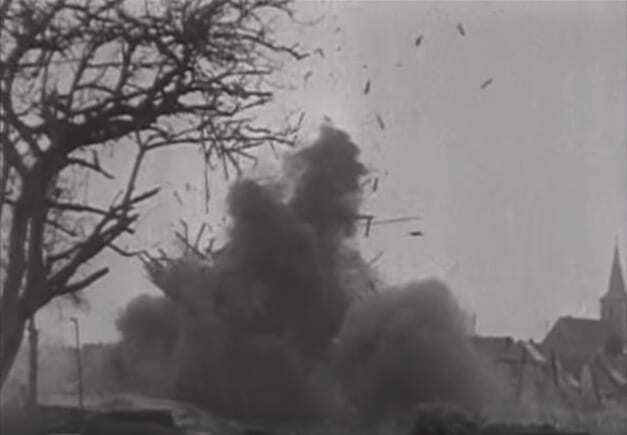 And boy, did those bullets and artillery rounds fly. Constantly. For an entire month. Immediately after landing on the shores of Europe, Gundy was sent to fight in the largest battle in US history. The United States and Allied forces were losing so many men at the Battle of the Bulge that commanders started taking drivers and chefs and giving them weapons to fight with on the front lines. People were given all manner of weapons that they had never trained on, as the Allies simply needed people who would be able to fight. This is how Gundy got his sniper rifle. His commander heard he was an expert marksman, and just handed it to him. What is Battle of the Bulge? 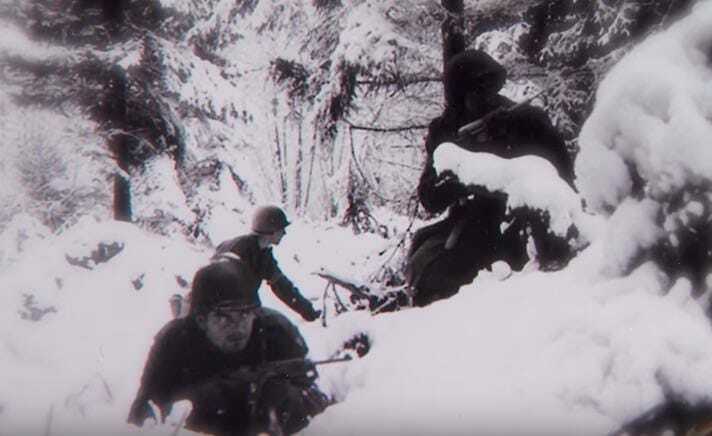 The Battle of the Bulge was Hitler’s last stand to try and stop the Allied advance from the West into Germany. His 405,000 soldiers mounted a sneak attack on the Allies’ 650,000 troops stationed in the triborder area between France, Belgium, and Germany. The battle lasted a month and ended when the Germans surrendered, having lost up to 125,000 men (according to some estimates). The Allies meanwhile lost 106,000 men, 105,000 of which were US troops. The 19 year old Gundy was digging foxholes in order to take cover from German artillery rounds in the middle of the battle. Every once in awhile a round would come whistling by, and they would have to lay on the ground. 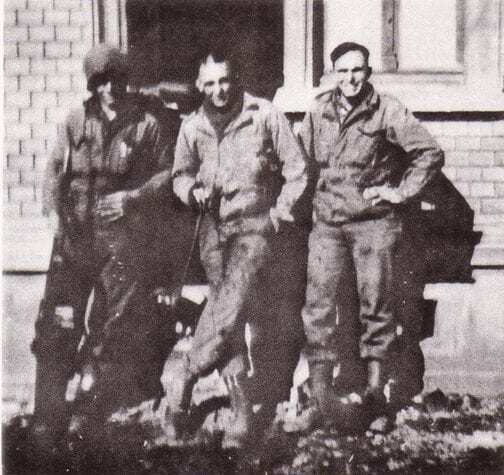 But one day, while patrolling in Germany, Gundy was not so lucky, and an artillery round landed next to him and blew his right leg to shreds. His friend stopped the bleeding by Gundy’s a shoelace on his leg, and Gundy was evacuated home. Gundy went back home to Missouri and ended up getting awarded a purple star for his bravery in action. He got a prosthetic leg, and began to get back into the swing of a normal life. In fact, he even took up hunting again, his favorite being quick footed whitetail deer. Gundy loves the outdoors and also loves the Outdoor Channel on TV. 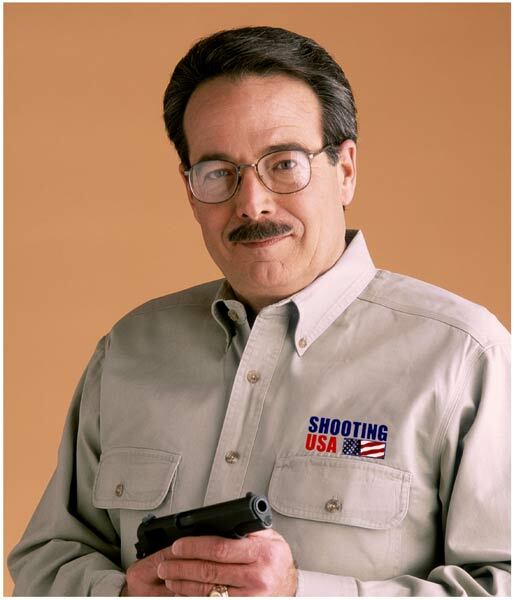 His favorite show on his favorite channel was Shooting USA, a show about America’s top Marksman. Ted was watching a program about how snipers are now able to shoot at ranges of over half a mile or more using modern sniper rifles, such as the Remington 700 as well as the L96 sniper rifle. Being a lifelong outdoorsman and sharpshooter, Gundy was really anxious to shoot a target 1000 yards away. So he wrote to Shooting USA, and, to his great shock, he received a reply. The first thing that Jim Scoutten, the presenter of Shooting USA thought when he read the letter was, is this guy real? The man must be in his mid 80’s. Would he really be able to shoot steadily? And more importantly, was this elderly man senile? So he decided to call him. Ted’s daughter, concerned that Jim was a scammer, got on the phone to speak with Jim, but quickly decided that Jim was the real deal. Meanwhile, now it was Jim’s turn to be suspicious of this random man from Missouri. Was he really everything he said? 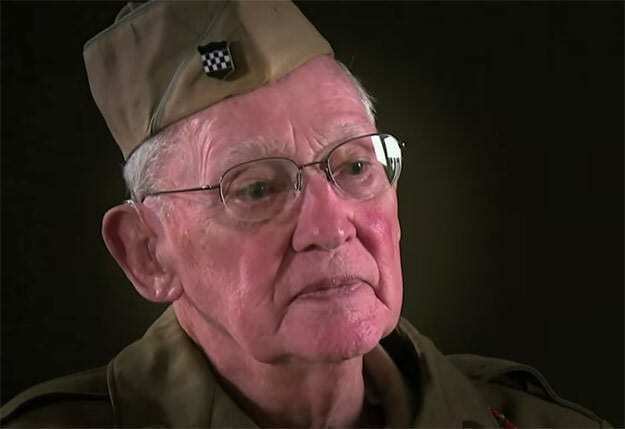 Did he really regularly hit Nazis at ranges of 300+ yards at the Battle of the Bulge? 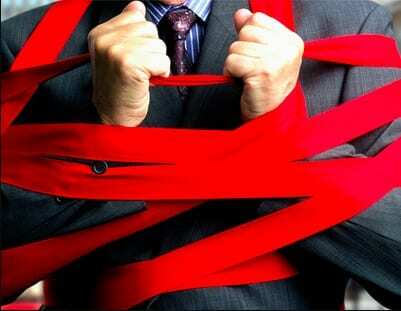 It took a lot of evidence – from medals to pictures to even Ted getting dressed in his World War II dress uniform. Ted’s daughter even sent pictures of Gundy marching with his prosthetic leg to prove that his story was true. Jim Scoutten knew that he had a real treasure on his hands, and he wanted to get Gundy onto the show as quickly as possible. So, Scoutten wrote to his friend Lieutenant Colonel Daniel Honde who was the Commander of the US Marksmanship Unit which was based in Ft Benning, GA. Scoutten wanted to see if he could have Gundy shoot at 1000 yards with the US Sniper team. Both LTC Honde as well as the sniper team were all for it. However, as with anything related to the military, there were forms to fill out (and probably in triplicate). Both Scoutten as well as LTC Honde wanted to give Gundy the time of his life. 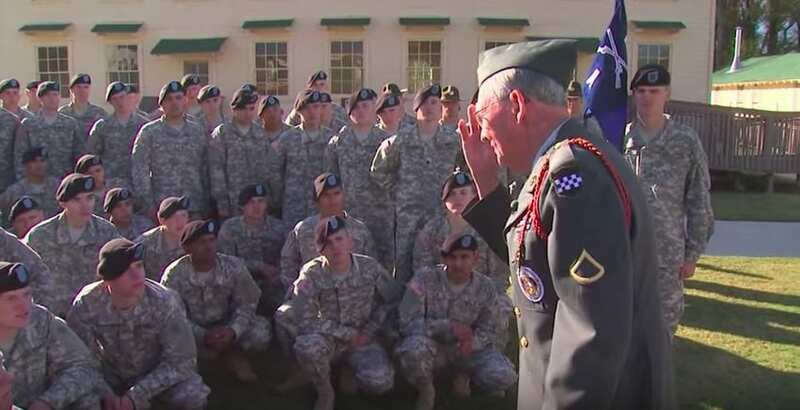 So, they arranged for him to sleep in the VIP sleeping quarters reserved for visiting generals and foreign dignitaries on base, as well as have access to the base’s dining facility. Ted sure would be surprised to see actual chefs as opposed to random sergeants cooking the food. 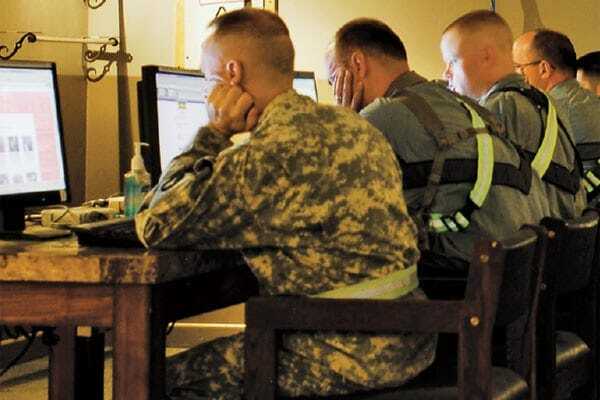 And yet the pile of approvals, forms, signatures, and documents only mounted when the show requested access to and the ability to film in the National Infantry Museum. 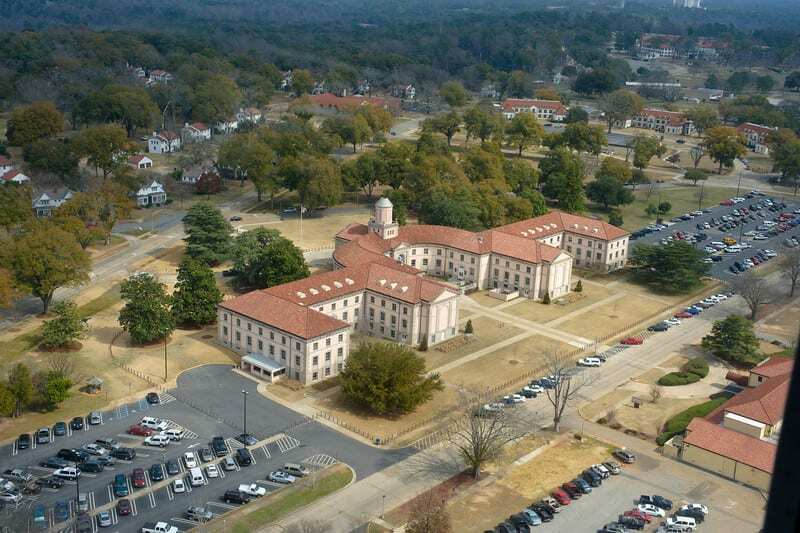 The museum itself is located a bit outside of Ft. Benning, and is not owned by the military, so special permissions needed to be filed in order to be able to film at the museum and speak to the people there. 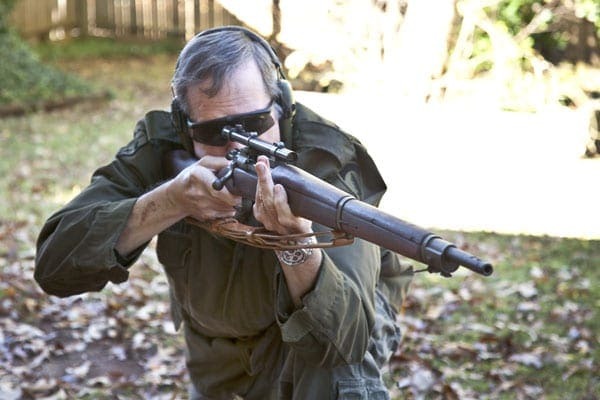 One of the things that Jim Scoutten wanted to have on site for the filming of the episode involving Ted Gundy was the exact gun which Gundy would have used while shooting Nazis at the Battle of the Bulge. The gun, which was an ‘03 Springfield A-4 Sniper Rifle and Scope, was handed to the young Gundy due to his marksman skills. Gundy saved countless American lives with the weapon, and Scoutten wanted Gundy to shoot one again. 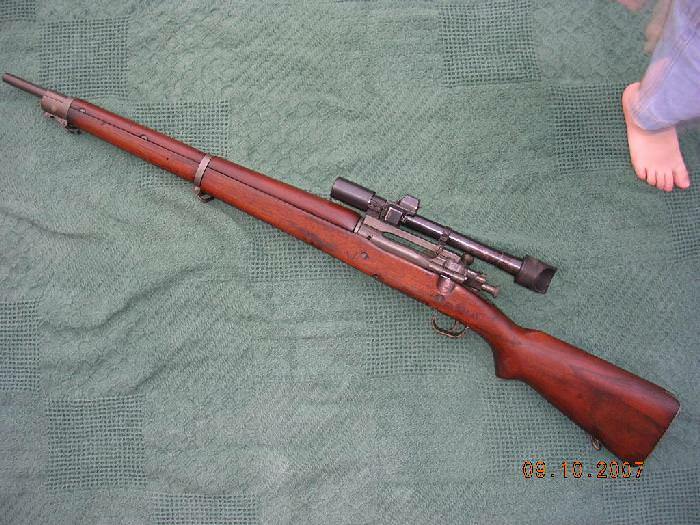 The 03 Springfield A-4 Sniper Rifle and Scope, better known as the M1903A4 Springfield has its roots in World War I. However, after a plethora of design and mechanical improvements, it was re-issued to troops in World War II. While the weapon itself was fine and was able to shoot relatively accurately at 500 yards, the scope itself had a lot of issues, regularly becoming waterlogged or foggy. Well over a million of these weapons were produced between 1903 and 1949. One of the biggest challenges that Jim Scoutten had when looking for this weapon for Ted to shoot was simply finding one which was affordable. 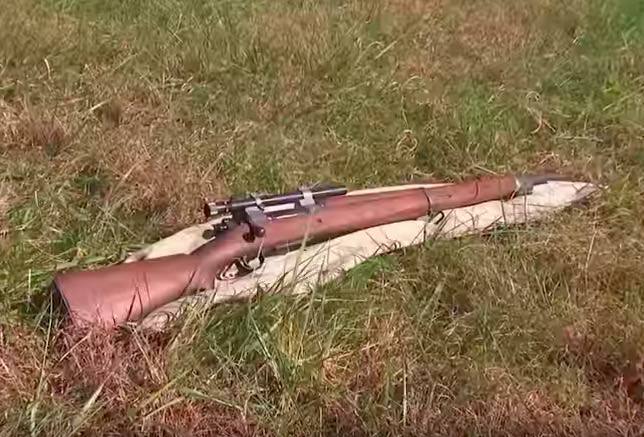 There were many collectors and companies who had original M1903A4 rifles but they all cost between $4,000 and $7,000 which was much to expensive for the show. So, Scoutten contacted Val Forgett of the Gibbs Rifle Company to create a working replica of the weapon. Forgett personally flew to Georgia to meet Gundy and present him with the gun. 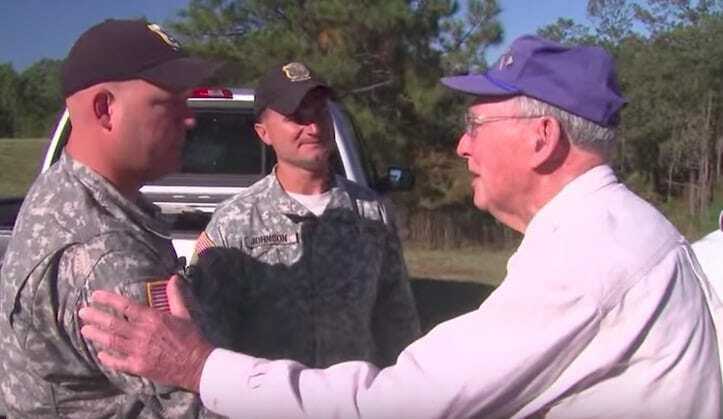 So, at 84 years old, Ted and his son Mike flew over to Georgia in order to go and shoot at Ft. Benning. Ted just so happened to be at the military base when the United States Sniper School was graduating its newest class. Gundy laughed when he mentioned that when he was in the military, there was no such thing as sniper school. You just had to learn how to be a sniper on the go. One of the people who Ted Gundy met was a sniper named Josh Olsen. While fighting in Iraq in the northern town of Tel Afar, Olsen’s humvee was ambushed by a bunch of insurgents who fired rocket propelled grenades (RPGs) at his vehicle. However, one of the RPGs hit Olsen, taking his leg along with it. Olsen is still in the military, and is in the elite army marksman unit which competes in international shooting competitions. 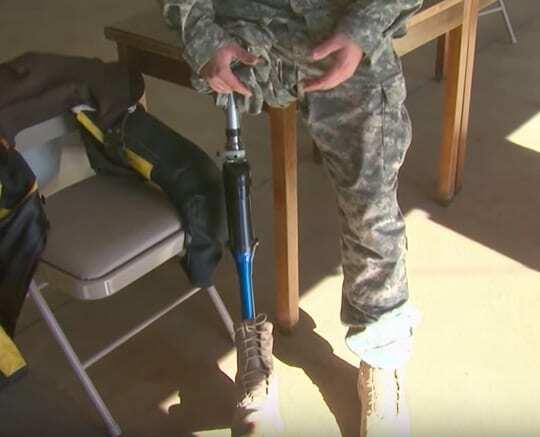 Josh Olsen has had a tough time coming to terms with the fact that he is missing a leg and that he has to rely on a titanium prosthetic in order to get around. The former star athlete feels that a large part of him has been taken away, and sometimes did not find the strength to go on. 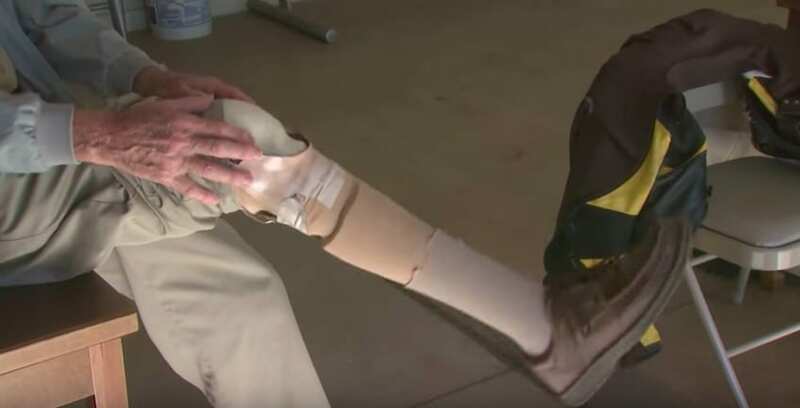 However, meeting a man like Ted Gundy, who has been on a prosthetic leg for over 60 years, gives Olsen hope that he too can live a long, fulfilling life while having a missing leg. 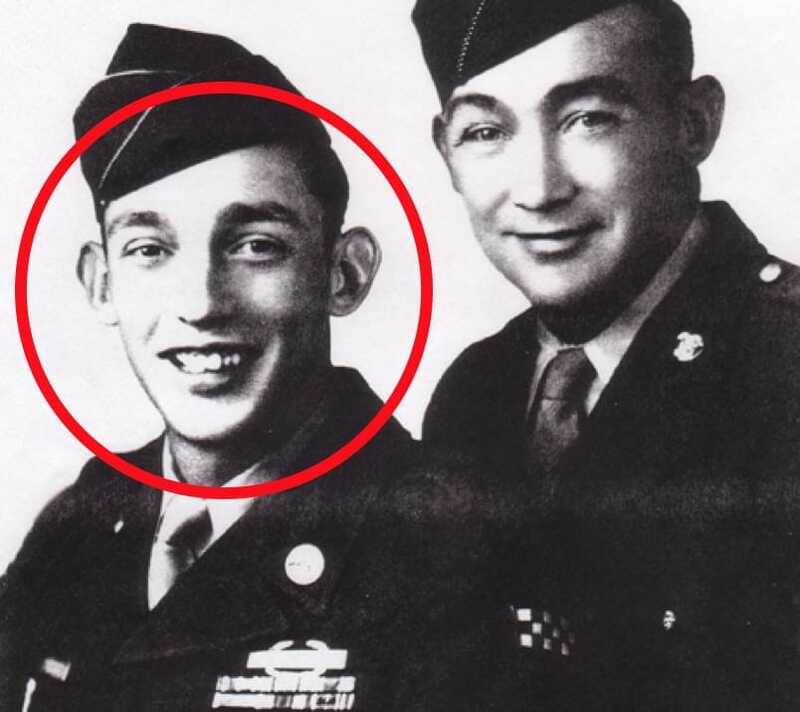 Despite the fact that Ted Gundy did not go through the rigorous training which the young guys today receive in sniper school, Gundy is still to this day considered a part of the sniper fraternity, having been a sniper in World War II. Regarding the work he did and that snipers do, Gundy said that it’s an awful line of work having to kill somebody, but there is no alternative when the other person is also trying to kill you. 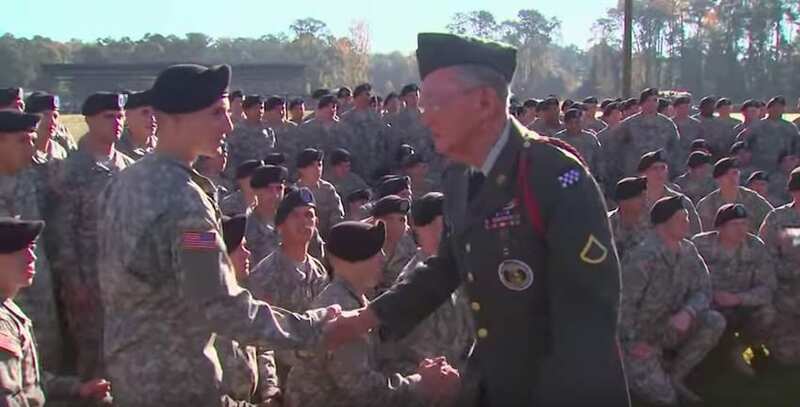 When Ted Gundy finally made it onto the shooting range in Ft. Benning Georgia, he was greeted by the top sniper team in the world. The team, consisting of SFC Robby Johnson as the shooter and SFC Jason St. John as the spotter, have been named the two best military sharpshooters in the world two years in a row. If anyone is going to coach you to shooting 1000 yards, it’s going to be these two. 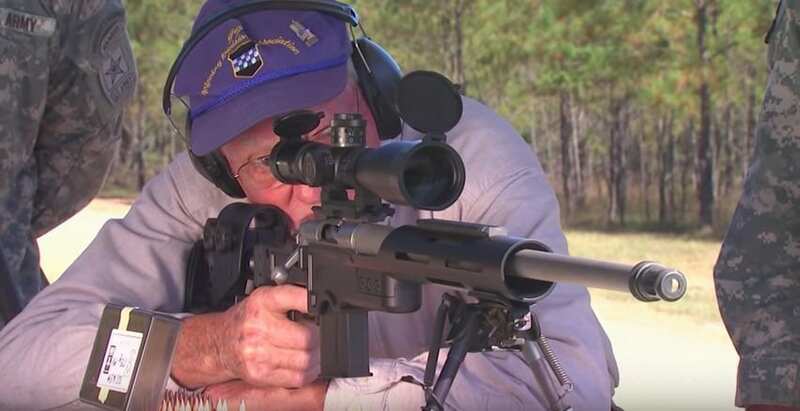 Ted Gundy was fully expecting to be only shooting the Remington 700 that the United States sniper team regularly used, but was then given a complete surprise. 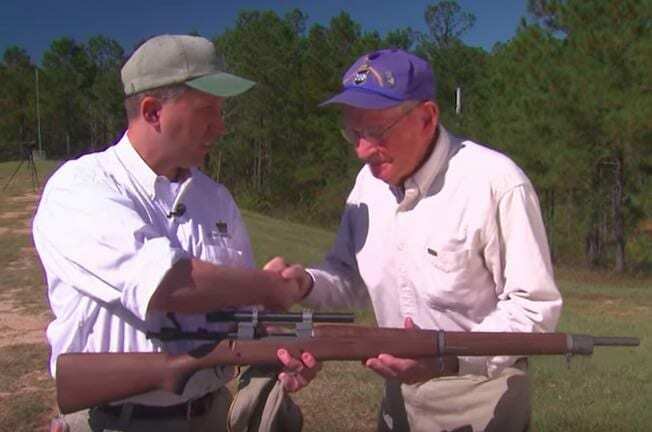 Val Forgett of the Gibbs Rifle Company was at Ft. Benning in order to present Gundy with an exact, working replica of the M1903A4 Springfield he would have used in the Battle of the Bulge. With great excitement and with a lot of emotion, Gundy received the gun, and prepared to shoot. 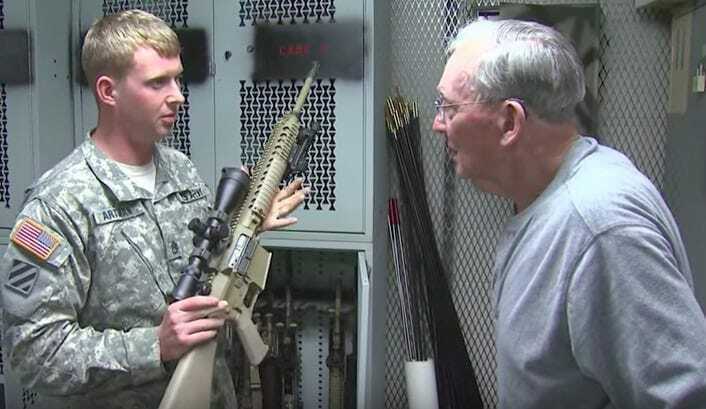 It had been over 60 years since Ted Gundy last fired an M903A4 Springfield. However, he was used to hunting white tailed deer near his home in Missouri, so he has over seven generations worth of shooting experience. And yet, despite not firing this particular gun since the Battle of the Bulge, Ted Gundy was able to score three direct hits in a row on a target placed 300 yards away. And now, here it was, the moment of truth. The 1,000 yard shot. Ted Gundy was shocked that he was getting to do this and have a chance of even pulling off this feat. 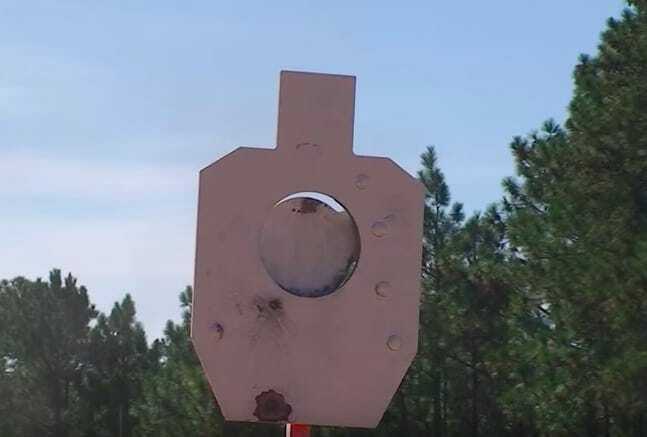 He thought he was doing well when he shot at 300 yards, but this was over triple the distance. He was also shocked that snipers shooting at this distance or longer could even see another human so far out. But having the Remington 700, one of the world’s most accurate rifles at his disposal, will sure help. In order to hit the target at such a huge distance, there is a lot of physics involved. For instance, the drop of the bullet as well as the distance away from the shooter must be taken into account. Depending on the distance, the curvature of the earth as well as the direction the earth is spinning must also be calculated, on top of windspeed. For instance, at 1000 yards, for every mile an hour of wind, the scope must be adjusted by nearly a foot. 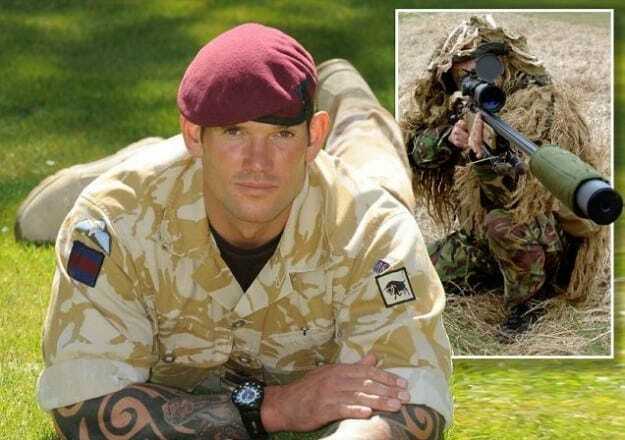 Perhaps one of the most technical, impressive sniper kills ever recorded was shot off by British Royal Marine Sniper Matthew Hughes. Hughes was in Iraq in 2003 when he saw that a forward squad of British soldiers were pinned down by an Iraqi soldier half a mile away. It was a very windy day with tons of heat haze, but he was able to shoot his target and take him out. It required him to shoot 38 feet high and 56 feet to the left, but he did it. Before he goes up to shoot the target, Ted Gundy says that despite the challenge, he is not sure he can hit it. In fact, he gives himself 9 to 1 odds on actually hitting the target. However, with the right equipment and the right coaches – especially two of the best snipers in the world – his chances are looking good. Add into the fact that he has been shooting for nearly 70 years, and we would put his chances at great. Ted Gundy shoots the trigger. About a second later, a small “ding” rings out across the shooting range. Ted Gundy has hit the target right in the head. Gundy said that his heart was pounding hard in his chest, and that he was breathing so heavily during that first shot that it was really lucky he even hit the target. Gundy said that the fact that he hit at all was due to beginner’s luck. 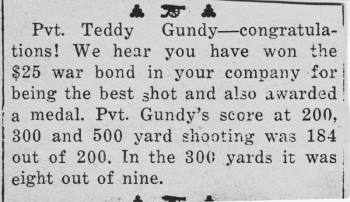 It turns out that after shooting three times, Ted Gundy was able to get all three of his shots within a five inch group. That means that from the top shot to the bottom shot, the space is only about five inches. The gun makers themselves do not even claim that the gun can perform that well. This means that Gundy’s marksmanship is perhaps one of the best in the world. As the spotter, SFC Jason St. John said, what Gundy did was supposed to be impossible. 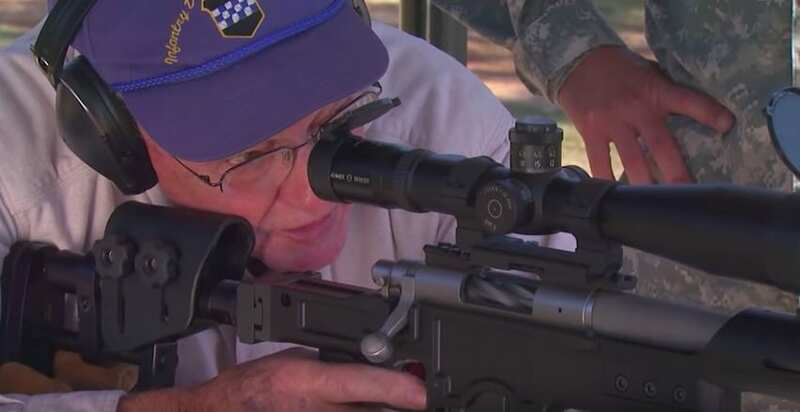 One of the main issues that that Shooting USA presenter Jim Scoutten was worried about in having Ted Gundy come and shoot at Ft. Benning was tiring the senior citizen out with all of the walking. Walking with a prosthetic leg is difficult enough when you are young and healthy, but it is even more difficult with an 84 year old man. But, as it turned out, It wasn’t Ted’s feet or joints which hurt as he was on base, but his right hand from shaking hands with so many people. 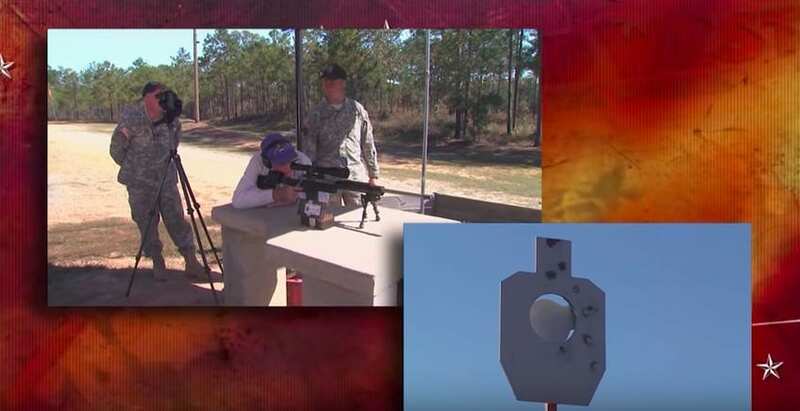 One of the most coveted prizes for a top sniper in the United States Military is receiving the black hat of the Marksmanship Unit. 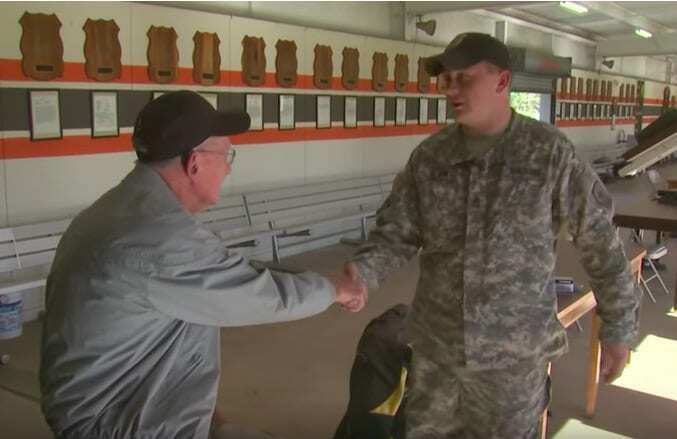 After showing that he still not only has good marksmanship, but great aim as well head of the United States Marksmanship Unit LTC Daniel Honde presented Ted Gundy with the black hat of the unit. 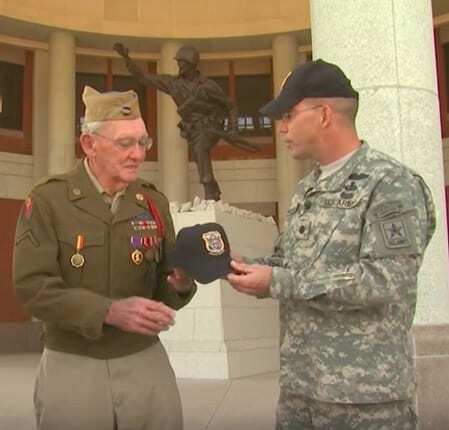 Gundy is only one of eight non-marksmanship unit personnel to have received the hat. He clearly earned it.